What is Anjali Mudra? The word “anjali” means “two handfuls”, derived from the cupping of both hands together as if holding something within. The Anjali Mudra can be expressed that two both hands are joined together at chest level or at the forehead. Why? Because only with the heart, or with a deeper spiritual insight (third eye) can one truly see that we are all expressions of the same light. The two hands placed against each other symbolize two inseparable spheres of existence, the spiritual and material. The Anjali Mudra is often seen on images and statues of the many-armed Kannon in Japan, also known as Namaskara Mudra, the oldest of Indian gestures. The mudra is displayed by Boddhisattva and lesser personages who attend upon or pay homage to the Buddha. It is a symbol of respect and devotion to a higher being and evokes greeting another being with the utmost respect and adoration for the Divine in all. 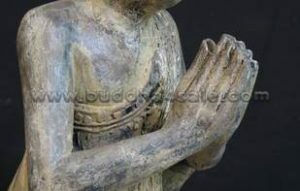 Interestingly, as the story goes, true Buddhas no longer make this hand gesture. There is speculation that because once you are one with the Light/Divine energy, you no longer need to express adoration for it. In Buddhist tradition, they are known as Vajradhatu (diamond world) and Garbhadhatu (matrix world). It is employed during prostrations, when the joined and cupped hands are placed against the forehead, throat and heart to indicate purity of the mind, speech and body. So where is the best FengShui placement for a Anjali/Namaskara Mudra Buddha? It is highly recommended to consecrate a Anjali/Namaskara Mudra Buddha at the main entrance of your home, living room or any other places where have welcome energy. Just by looking at this Buddha hand gesture one can connect to the energy of deep peace and serenity. It is a powerful FengShui decor adapt to any places!